One of the project partners of the Swiss Employers’ Association's April 2015 report on "Women on Boards - 400 proposals for Swiss companies" or in German "Frauen im Verwaltungsrat – 400 Vorschläge für Schweizer Gesellschaften". Before founding AdValorem Partners, a leadership advisory boutique, François E. Clerc was a Senior Partner at the world largest privately owned executive search firm. Based in Geneva, he worked at local, national and European level for a wide range of clients ranging from Swiss privately owned companies to Fortune 500 multinationals. Prior to his consulting years, he was managing director of a Swiss company active in the Asia Pacific region, based in Hong Kong. François started his career at HP Europe and spent 15 years in the technology field. Since 2000, he is an active promoter of Advisory Boards and Boards' governance. He is the producer of a radio show called "Executive Life" that hosted senior leaders to talk about the ingredients of their success and the lessons learned from their failure. Lastly, he is the founder of the Presidents Club, an informal advisory board active in the Lemanic region gathering CEOs and Presidents from the international local community. Recently, François also co-founded Triple A Associés a company that offers workshops in corporate governance in Switzerland. He is also the CEO of a medical group, of which he used to be an advisor to the board. Sabine Beppler-Spahl studied economics at the University of Hamburg. She went to school in Hong-Kong and Germany. She currently works in adult education in Berlin and lectures at the University of Applied Sciences in Potsdam. She speaks English, French (Diplome approfondi in 2001) and Spanish. She is also a regular contributor to the German magazine NovoArgumente and has published articles in Die Welt, Berliner Zeitung, Frankfurter Allgemeine Sonntagszeitung, Zeitschrift Merkur and other publications. She is married and has two children. Carlos Orozco is a Mechanical Engineer from Universidad de los Andes in Bogota, Colombia and a successful international executive, expert on the subjects of Innovation and Transformation Strategies for Value Growth. He worked for over 28 years with The Dow Chemical Company (Dow) in Latin America, USA and Europe, occupying global leadership positions. Carlos is known for his ability to create and manage organizations driven by a culture of innovation, and was decorated in 2008 with the "Genesis" award, the highest global recognition of Dow leaders. Dr. Barbara Lang is CEO of joba AG –Corporate Health Made in Switzerland. The former IBM Manager and management consultant is now working with companies to improve their „Corporate Health". She has the metrics and tools to help corporations develop a healthy, inclusive corporate culture that allows people to be their best. While many corporations still focus on programs to “fix the men and women”, she found the true leverage elsewhere. Values have changed – but have corporate structures? Are gender quotas a waste of time? Do women require special pleading and new laws to “break the glass ceiling” on gender? Since 2012 EU Commission has campaigned to make it a legal requirement for the largest 5,000 businesses in Europe to employ 40 per cent women in leadership positions by 2020. 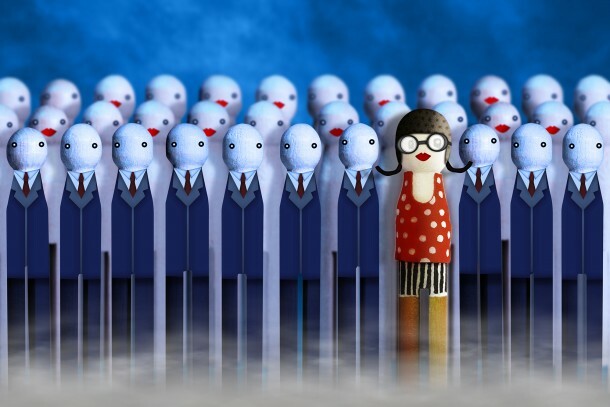 Last year the Swiss Cabinet of seven ministers called for a minimum of 30% of the boards of major companies and institutions with close connections to the Swiss government to be composed of women by 2020. But decided not to make it legally binding. Some claim that companies with mixed gender boards are more innovative and more successful commercially because they bring diversity of views and behaviour into the corporate world. Meanwhile most workplaces are desperate to recruit more women to senior positions. However even some feminists acknowledge it is women themselves who sometimes choose less demanding careers in order to take responsibility for their children, inevitably earning less money and prestige. Unsurprisingly, firms dislike being bossed by government. A recent survey by the Swiss Employers’ Association (SEA) found that companies prefer to create their own codes of best practice when it comes to setting their corporate governance commitments. Indeed, according to the SEA’s president Valentin Vogt, legal quotas risk undermining entrepreneurial freedom. Nevertheless his organization acknowledges that the current situation of low female representation at the top of business is not acceptable. 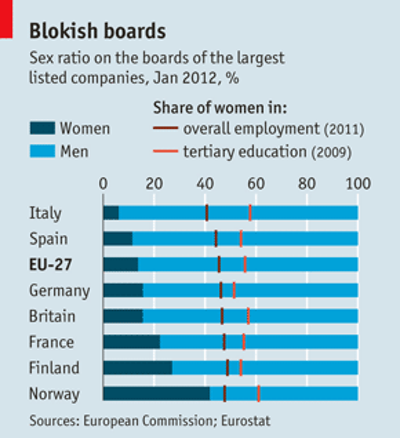 Do the quoted statistics on women failing to reach the top of the ladder justify fixed quotas ? Does an argument that claims women have “unique qualities” not risk being trapped by prejudice and stereotyping? In other words, are our characters really defined by our gender? Does modern obsession with the gender balance of top corporate jobs miss the point that different people make different choices? Should we place most of our campaigning zeal on more mundane but substantial obstacles that women confront like the lack of child-care options? Do misogynist employers with sexist attitudes really exist today outside the imagination of campaigners? And do women require legal protection from the state because they are too weak to make their own choices and or to fight and win their own battles? On International Women’s Day in 2013, U.S. President Barack Obama remarked that, “Empowering women isn’t just the right thing to do, it’s the smart thing to do.” Just last month Germany became the latest nation to institute a mandatory requirement for the number of women in supervisory board positions, joining such countries as Norway, Iceland, Spain, France, Italy and Belgium with boardroom quotas ranging from 30-40 percent. These notions of gender difference are barriers to progressive change - and that’s bad news for men and women. What we need instead are more women and men with balls. Even Jutta von Falkenhausen, vice-president of FidAR, the powerful German group campaigning to get more women on to corporate boards, finds targets unpalatable. “We don’t like quotas, we don’t like coercion. But if we don’t have mandatory rules, nothing will change,” she says. Early analysis appears to show that quotas work and have been highly successful across Europe. This could result in a quota system being considered at EU level. Turkey provides a prime example of how misleading it is to view boardroom diversity as the sole barometer of equal opportunities for women. It is no longer a man’s world, in the sense that nothing is now stopping women from playing as much of a role as they want to. Trouble is, they don’t seem to want to. Women have gained their equality at a time when the public worlds of work and politics, the grand ambitions of power and control, have been emptied out of their positive content, and re-presented as stressful, destructive and ultimately pointless. Who would be a politician when they are all seen as untrustworthy bastards; a company CEO when they are all seen as unscrupulous fat cats; somebody who dedicates their life to their work when they are told off for neglecting their kids? Who would be a man in this world? Norway's law requiring at least 40 percent of public limited company board members to be women has made the panels more professional and globally focused, the head of its largest domestic-focused investment fund said on Monday. In 2003 Norway became the first country in the world to impose a gender quota, requiring nearly 500 firms, including 175 firms listed on the Oslo bourse, to raise the proportion of women on their boards to 40 percent.